Which new car would you buy? If you were going to buy a new car, what would you get do you think? I wrote a short email reply…then decide this topic is worth a deeper dive (of only for my own personal edification). You see, Kim and I have been talking about cars lately. Mine is fifteen years old and hers is over twenty. Although both are running fine, we realize that we'll have to replace one (or both) of them in the near future. When we do, what will we buy? What kind of new car is right for Kim? What kind of car is right for me? Let's start by looking at the cars I've owned in the past. I am not a car guy. Even though I can appreciate nice cars, I don't have any desire to own them. I'm not sure why. Maybe it's because my parents never had nice cars when I was a kid. They had practical, serviceable vehicles that got the job done. During my 33 years of driving, I've owned five cars. 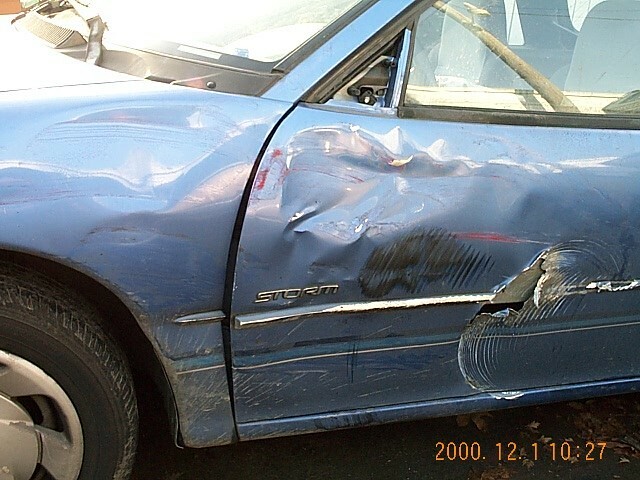 On 01 December 2000, a semi sideswiped my Geo Storm on the freeway during morning traffic. The car spun 360+ degrees before striking an overpass guardrail, deploying the airbag. The car was totalled; fortunately, I wasn't hurt. 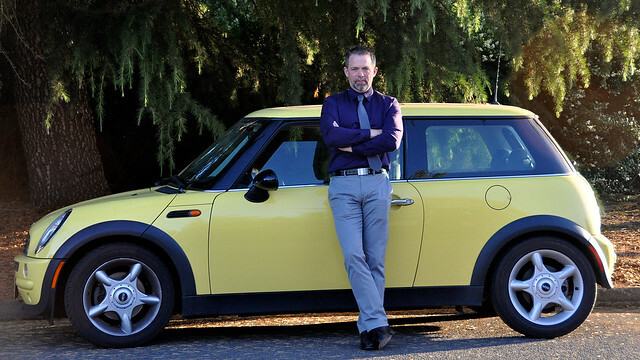 In 2009, after years of dreaming about it, I realized I could afford to buy a used Mini Cooper. By this point, I'd been writing GRS for three years, so I put my own advice into practice. I shopped around. I bought used. I paid $15,000 cash. 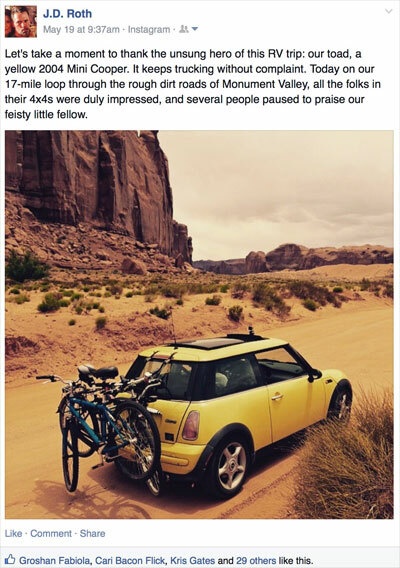 I've owned that 2004 Mini Cooper for more than nine years now. In fact, as of this month, it's the car I've owned longest in my lifetime. While I'm not a rabid anti-car crusader, there's no doubt I think the U.S. is too car-centric. I understand the historical reasons behind our vehicle dependence — we're a young nation with sprawling cities spread far apart — but I also believe that if you, as an individual, make an effort to live in a walkable (or bike-able) neighborhood, you can save tons of cash while enhancing your lifestyle. How much can you save? Well, that's tough to quantify. There are a lot of variables that go into the calculation. The folks at Transportation Evolved, however, have mae an effort to crunch the numbers. They've created a cost of commuting calculator that takes into account a wide variety of factors — then allows you to further explore how this cost affects your true hourly wage and the opportunity cost of lost inverstment income. Since my commute involves a 30-second walk down to my writing shed, this calculator doesn't work for me. But Kim commutes 9.1 miles three times a week (or more) in her 1997 Honda Accord. I ran the numbers for her situation and they're not terrible. And the opportunity cost? Assuming she invested in index funds for 20 years, the Transportation Evolved calculator estimates she's missing out on $154,352 at retirement. Kim and I have been talking a lot about cars during the past few months. She drives a 1996 Honda Accord with 226,000 miles on it. The car runs fine and has served her well, but she's begun to think about the possibility of upgrading. Neither one of us is ready to make a move yet. We both believe that you should drive a car until it dies. (Although once I get the bill for the repairs to my Mini, I may be singing a different tune.) Still, it doesn't hurt to gather resources while we wait. Earlier this week, for instance, Automotive News released a comprehensive Guide to Certified Pre-Owned Vehicle Programs. This 12-page PDF [1.7mb] includes a run-down of dealer fees, the types of vehicles that qualify, and — most importantly — warranty details. I have mixed feelings (and experiences) about buying a used car from a dealership. Buying a certified pre-owned vehicle would allay some of my concerns. Everyone loves a guilty pleasure every now and again — so long as it's something harmless like belting out your favorite Country Western song on your way to the grocery store. But when it comes to these summer indulgences, you may end up singing the budget blues. Of course, it's hard to complain about random expenditures if you keep a fully stocked emergency fund in your savings account and budget for unexpected repairs and impromptu get-togethers every month. But if you aren't there in your personal finance journey yet, these splurges could set your finances back quite a ways. It's important to remember that, even when things are going good, something is bound to break from time to time. And when that happens, it's best to be prepared. Enjoy the summer months as you work toward financial independence, but try to avoid summer splurges that you might regret. There's something about summer that can make car shopping irresistible for some people, which is exactly what dealerships are counting on. 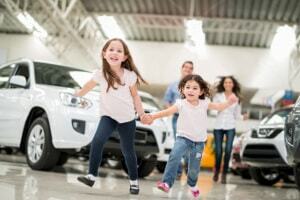 Unfortunately, with the average new car or truck coming in at $33,340 in June 2015, this could very well be one of the most expensive summer spending traps of all. Although it's only July, I already know two people who randomly bought a brand new car after driving past a dealership and falling in love. How do I know? They told me. Guilty! There's something about warm weather and the neighborhood pool being open that makes me want to light up the barbecue and hang out with my friends. Unfortunately, the cost of all of those outdoor get-togethers and pitch-ins adds up quickly — especially if alcohol is involved. Even if you just drink during summer, buying a $20 case of beer once per week can add close to $240 to your food budget over a 12-week period. If you drink hard liquor or insist on margaritas at the drop of your party hat, it can add up even faster. We all know how difficult it is to scrape funds together to take your family on a summer vacation; but what's worse is how it all goes sideways once you get there. Recently, a friend confided in me that her family went more than $500 over budget during a three-day, out-of-state trip to a theme park — and she didn't even know it until she got home! It's easy to splurge at the theme park. 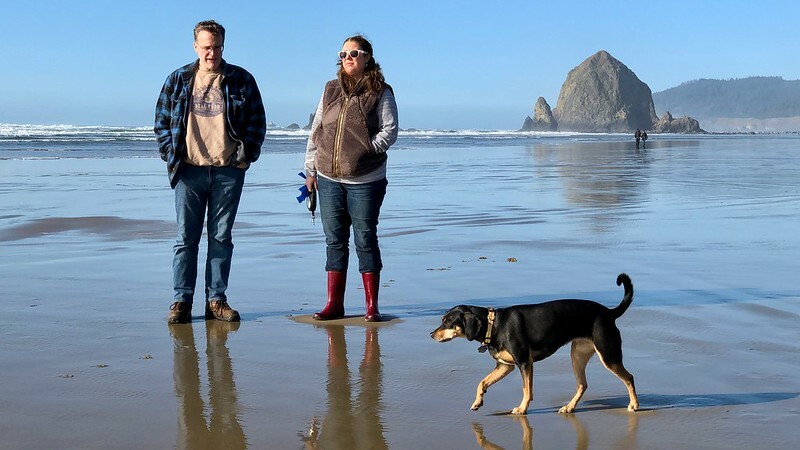 Even if you plan your trip down to the penny, being on vacation makes it easy to ignore the bills and focus on family fun. Unfortunately, the bills will be waiting for you when you get home and have to hobble back into reality. In Central Indiana, you can usually get through spring and fall without turning on the air conditioning or furnace. Unfortunately, a few months of low utility bills is all that's required to forget just how high your AC bill can go in the summertime. I've experienced it myself. Typically, that first bill catches me off guard, and then I scale things back from there. With the average U.S. household electric bill at $395 in 2013 according to the U.S. Energy Information Administration, a little restraint can truly go a long way. Elaborate Christmas light displays during the holidays aren't the only keeping-up-with-the-Joneses splurges during the year. Perhaps it has something to do with the demographics in my area, but it seems like most people in our part of town are absolutely yard-crazy. It doesn't help when your next-door-neighbor owns a landscaping company either. Every day of the year, his property looks like it came straight out of a Better Homes & Garden magazine cover shoot — and it feels like everyone else is trying to keep up. Between yard treatments, professional mowing services, and landscaping, the budget for yard work can easily top $300 per month. How much could you save with a lawn mower you found on Craigslist and use during the cool early morning hours? Summer is the most popular season for weddings, but getting an invitation to more than a few each year can truly break the bank. This is especially true for destination weddings or post-wedding parties. I know one couple, for example, who recently spent $3,000 for a wedding party they will attend abroad later this year. The average cost of a wedding reached an all-time high of over $31,000 earlier this year, but being part of the wedding party can be pricey as well. Between paying for a tux or a bridesmaid dress, paying for transportation and lodging, and attending all of the wedding-related events, the costs can amount to a large burden if you aren't judicious. There is certainly nothing wrong with having fun during summer — that is, if you can find a way to fit your idea of fun into your budget. My family actually opted to raise our grocery budget by $100 during the summer of 2014; and we did it again this year to make room for more barbecues, pitch-ins, and card parties. Doing so didn't feel like a failure in my eyes. Since I hate to overextend my budget, it made sense to bring that budget line item up to a more reasonable level so we can enjoy the time with family and friends. It's also immeasurably cheaper to hang out at one of our homes rather than to go out to eat. Whereas a spending trap is something you fall victim to, a summer splurge can be well worth it if you plan accordingly. For me, paying an extra $300 for a summer full of get-togethers is a small price to pay, and chances are, you value similar things. Nonetheless, if your intention is to build your wealth, it pays to be intentional with your spending during the summer months too. 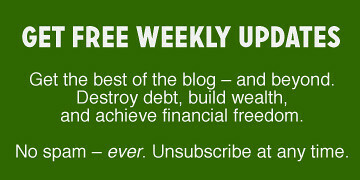 In my view, that's just part of the battle you have to wage in order to stay true to your financial goals. As always, the best way to avoid spending traps of any kind is to plan ahead and be mindful of your short-term and long-term goals. Summer comes every year, so there's nowhere to run and there's nowhere to hide. If you want to spend more when it's warm out, that's fine — just be intentional and plan ahead. Have you fallen into any of these summer spending traps lately? Do you have any expenses that surge during summer months? The odometer on my car is nearing 223,000 miles. While I am hoping the dented-on-all-four-sides sedan is going to make it to at least 250,000 miles and beyond, realistically, we need to plan for a replacement. But before we go car shopping, we need to decide what we are looking for. There are a lot of things to consider here like the manufacturer, style, color, etc., not to mention just our own personal tastes in the matter. You can really go to town thinking about all the possibilities. But I wanted to simplify the process. I wanted to narrow it down to the basic decision of finding the best car for our situation at a price we could afford. I didn't want our wants to become our needs, at least not until I got further along in the process. I was talking about it to the editor here at Get Rich Slowly, who shared a spreadsheet her husband created. The spreadsheet takes the cost of a vehicle and spreads it out over the remaining effective life of the vehicle. 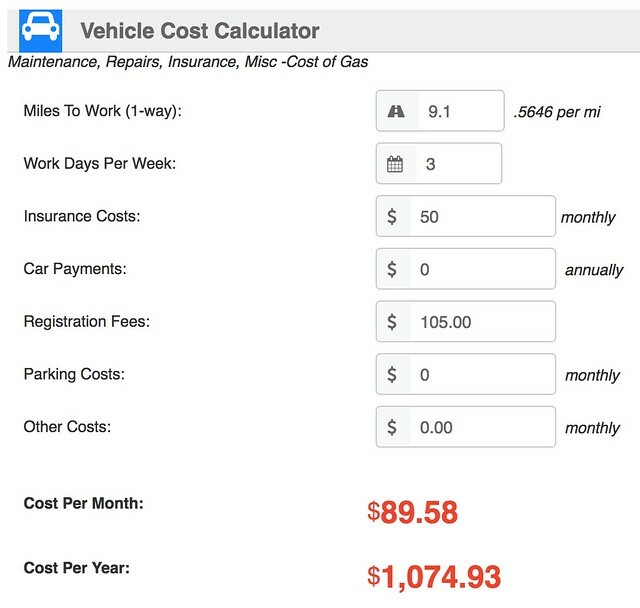 So using these two factors, the cost divided by the number of expected lifetime miles, you get the cost per mile. It's at least one way to compare different cars against each other in a way that's like comparing apples to apples and oranges to oranges. It doesn't factor in the cost to operate the vehicle, just the cost to purchase the vehicle. You can add the cost to operate into the mix later on to get a better picture of your overall cost if you want, but those costs depend on your own situation anyway. Using the formula below, you can create your own spreadsheet to get an idea of which cars could make a better purchase (at least from the standpoint of how much of a dent it makes to your wallet initially). The cars in the table below serve as examples, but you can instantly see how the cost per mile goes up depending how much the car costs, how many miles it has, and how long of a life it could have. The most cost-effective cars have a lower per-mile cost, like the 2008 Smart Car at $.07 per mile. It helps if you know generally what kind of vechicles to put into the spreadsheet to begin with, so I started to look at what I thought our needs might be. 1. Size. Currently, we are a family of five, although we may expand the family again. Anything is possible. In addition, having just enough seats for each family member is inconvenient when our kids have friends over. So a six-passenger vehicle would really be nice. However, I want to be open to the most economical option, so it is time to be realistic. We haven't added to the family. Wishing for additional seating happens maybe four to five times per year. Could we be creative to address that problem when it happens? Besides, there are very few six-passenger vehicle options. When I built my own spreadsheet, one Mazda and a few big truck models (and we don't want or need a big truck) were all I could find. From there, it's seven- or eight-passenger seating. 2. Expected lifetime. Opinions differ on how long cars drive without incurring major repair bills, but let's use 140,000 miles for a gas engine and 250,000 for a diesel. So many other factors affect this: your driving style, whether you perform preventive maintenance, and even the type of mileage you put on the vehicle, just to name a few. Now that I work from home — even though we typically drive out of state several times per year — I think 10,000 miles per year is a safe estimate for us. Since I seem to drive my vehicles for six to seven years (longer, if possible), it seems that we should set our sights on a car with 90,000 miles (or fewer) on it (140,000 minus 50,000 miles). I also would like it to be a 2006 or newer. I searched dealerships and private sales in my area. I originally started with vehicles with 90,000 miles or less, seating for five or more, and $10,000 or less. I got a surprise or two as I plugged different vehicles into the spreadsheet. My first surprise was how few vehicles fit within those parameters. Maybe this is just my geographical area, though — or am I dreaming to think that we could buy a vehicle with 70,000 miles for $10,000? Second, I assumed that cars would always be a cheaper option (as compared to minivans and SUVs). But that is not always the case. As an example, a Buick Lacrosse I found cost more per mile than a newer Chrysler Town and Country. Again, there are so many variables: size of car, options, etc., but this is a fun way to view the car's purchase price in black and white. Periodically, I have heard arguments about whether buying new or used cars is a better deal. I like buying used cars at this point in my life because I have a couple of mechanics in the family and I also don't want to tie up $30,000 in a car or minivan. In the few examples that I plugged into the spreadsheet, used trumped new every time. However, I didn't factor in any dealer incentives like cash back or zero-percent financing. Once I had a feel for how vehicles stacked up against each other in terms of raw cost per mile, I started thinking about the operating cost for some of the front-runners. 3. Cost to drive/maintain. Obviously, cars that get better gas mileage will be cheaper to drive. Gas mileage is easy to determine since it is listed with the car's specifications. It is more challenging to compare repair costs, though, because repairs on certain cars are more expensive than others. For instance, my brother works at a BMW dealership and says parts are so expensive on BMWs that he wouldn't drive one … even though he could do the repair work himself. Insurance costs depend on the type of car you drive, too. Adding different types of coverage — such as collision — if you buy a new car will increase your insurance premium as well. After we paid this car off four years ago, we kept putting $300 monthly into our savings account — and we threw some extra cash in the bucket whenever we could — until we had $10,000 saved up. This was a painless way to save because our budget already accommodated the car payment, so to continue paying the same amount was pretty easy. I've read about other methods, though, like adding varying amounts to your car account depending on how many miles you drive in a month: more miles = more money. I like this idea, too, because it encourages you to decrease your mileage. But it seemed like just another thing to think about, and I preferred the ease of an automatic payment withdrawal. You could also just put extra, unexpected money into a savings account, such as, bonuses, raises, gifts, and so on like we did; but how often do you get extra, unexpected money? Since it is unreliable, it doesn't seem like it would amount to much as quickly as saving every month. Then there is the method of not paying cash for vehicles at all. “We can make more by taking out car loans and then using the money we would have paid for the cars to gain better returns,” a friend said recently. I am glad it works for her, but I dislike car loans way too much to enjoy that. In a nutshell, this spreadsheet was very helpful to clarify what we wanted or needed. I confess to feeling overwhelmed when I think about what we'll buy next, so this spreadsheet will be the first step to trying to find the right vehicle. This research also showed me that $10,000 is probably not going to be enough, so we will be considering other sources to add to our savings account as well. I hope our car keeps on rolling for many more miles. I am curious: Is anyone else driving a vehicle that is just big enough to offer a spot for every member of your family? 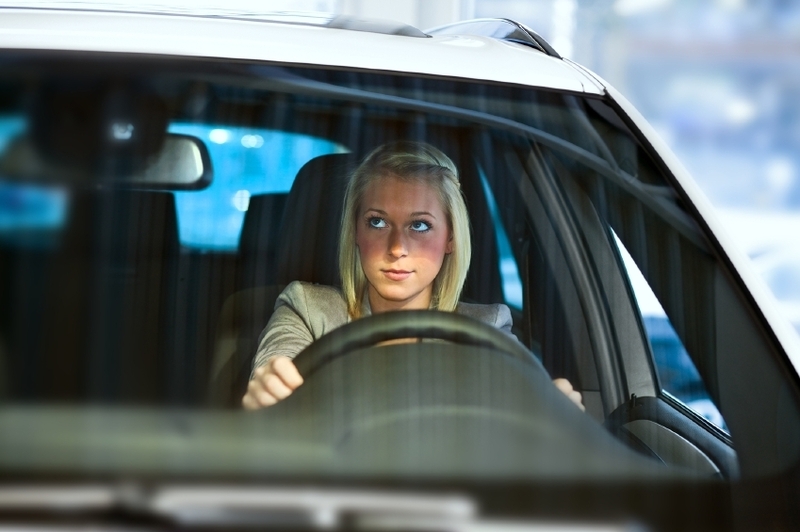 How do you decide which kind of vehicle to drive, and how do you save for a replacement? What does it cost to commute? In recent posts exploring job searches and the cost of jobs in general, the subject of commute came up in a number of the comments. Readers pointed out that a commute makes a huge difference in whether a job is desirable or not because it has a significant impact on quality of life. I couldn't agree more. 1. The cost of driving your vehicle. The reason this is important for calculating your commuting costs is because if you pay to park at work like I do, then your commuting miles are more expensive than the other miles that you drive. To figure out how much more, you'll have to add up the annual cost of parking and divide that by the number of miles you drive in a year for commuting purposes. Then add that extra expense to your cost per mile. 2. The cost of your time and your sanity. In addition to the actual cold, hard cash it takes to operate your vehicle, it is also important to consider other factors such as your time. Your time has value, too, and every minute you spend driving to and from work is a minute you can't spend doing other things. To a certain extent, you can add value to that time by listening to the news or books on tape. However, the longer your commute becomes, the less value you may derive from those activities, especially if they don't interest you. 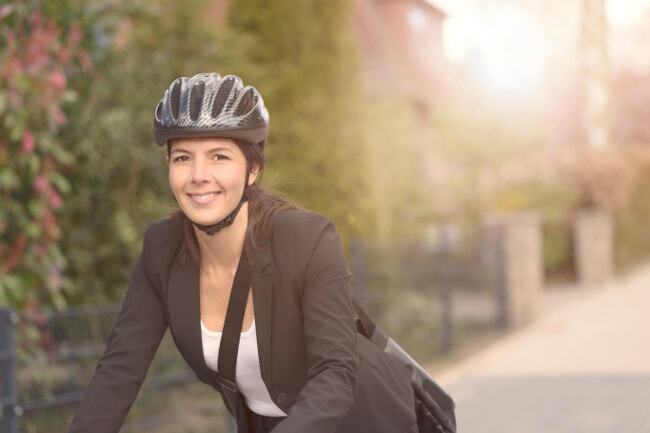 If you are able to bike or walk to work, like approximately 3.5 percent of Americans do (according to the ACS survey), then that time counts as both exercise and commute, which may add value. However, hoofing it isn't convenient for everyone and isn't possible year-round in many places. If driving is your best option — or your only option — then your sanity may also be a factor. When I first moved to my city, Jake had already rented a place that ended up being 45 minutes to an hour each way from the job I ended up getting. For someone who had been walking and biking to work for years, this was intolerable. What was extra frustrating is that making the same drive during non-rush hour times took 15 to 20 minutes! Jake, on the other hand, doesn't mind commuting. In his high-stress job, he finds that living a little farther from his work actually gives him time to distance himself mentally from his job. Then by the time he gets home he's calmed down enough to actually relax. How far do you commute to work and what do you think it costs? What do you do to make the best use of that time? If you were looking for a new job, would you try to minimize your commute?